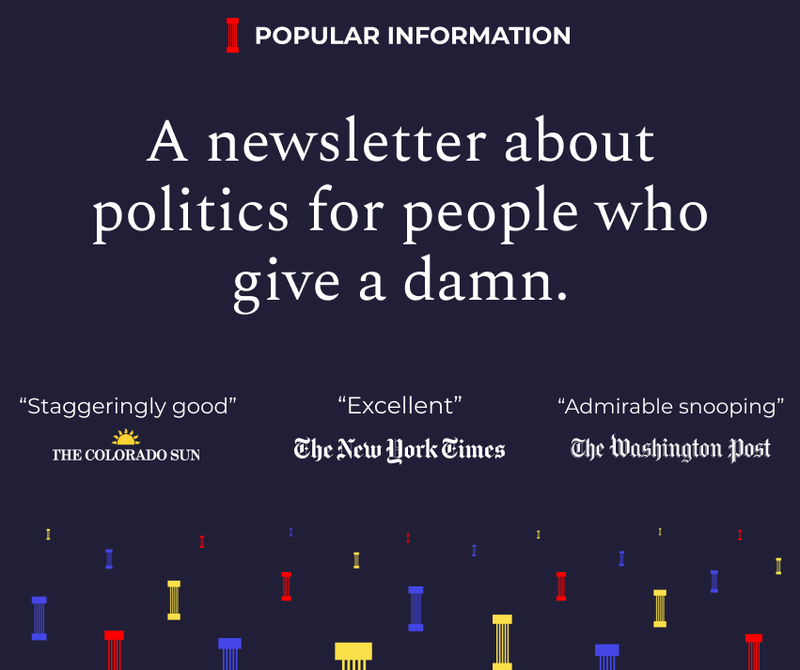 Today's newsletter features an inside look at the influence game in Trump's Washington, backed up by original reporting and research. It's a story you won't read anywhere else. You can support independent journalism that holds the powerful accountable — and get Popular Information four times per week — with a paid subscription. It's just $50 for an entire year. Since Popular Information launched in July 2018, it has consistently demonstrated the ability to break through the noise and create change — from Steve King to Cindy-Hyde Smith to the election fraud scandal in North Carolina. Popular Information is just getting started. Even more is possible with your support. Atiku Abubakar, the former vice president of Nigeria, had not visited the United States for twelve years. He is currently running for president and his inability to travel to the United States was being used by his political opponents in Nigeria as proof of his corruption and unsuitability for public office. A former U.S. government official confirmed to Popular Information that Abubakar was formally barred from obtaining a visa pursuant to a presidential proclamation targeting corrupt foreign officials. With the election less than a month away, Abubakar arrived in the United States last Thursday and promptly checked into the Trump hotel. What happened? In November, Abubakar hired a key member of Trump's political operation with a $1.1 million per year lobbying contract. Abubakar's visit was almost entirely ignored by the U.S. media. But it's a story that reveals a lot about how things work in Trump's Washington. $40 million in "suspect funds"
The corruption allegations against Abubakar are detailed in a 2010 bipartisan report by the U.S. Senate, "KEEPING FOREIGN CORRUPTION OUT OF THE UNITED STATES: FOUR CASE HISTORIES." Abubakar denies all allegations of corruption in the report and has never been criminally charged. The report says that Abubakar, through his wife, Jennifer Douglas Abubakar, funneled $40 million in "suspect funds" to the United States, including millions in "bribe payments." An alleged bribe which came from a major German corporation, Siemens, looms large. Siemens has admitted in court to engaging in widespread bribery and bank records link the corrupt activity to Abubakar and his wife. In December 2008, the U.S. Securities and Exchange Commission alleged in a formal complaint against Siemens AG, a German company, that, among other actions, in 2001 and 2002, Siemens wire transferred $2.8 million in bribe payments to a U.S. bank account belonging to Ms. Douglas as part of a scheme to bribe Nigerian officials. In response to this and other legal actions, Siemens admitted to engaging in widespread bribery payments, pled guilty to criminal violations and settled civil violations of the U.S. Foreign Corrupt Practices Act, and agreed to pay over $1.6 billion in civil and criminal fines. Ms. Douglas has denied any wrongdoing, but the Subcommittee has obtained financial records showing the transfer of over $1.7 million from Siemens AG to Ms. Douglas’ account at Citibank. Abubakar was also implicated in the investigation of William Jefferson, the former Congressman who is serving a 13-year sentence for corruption. Abubakar denies any wrongdoing connected to the case and has not been charged. But the FBI raided Abubakar's Maryland home during their investigation. An affidavit released by the FBI describes a scheme between Jefferson and Abubakar. The documents included an affidavit signed by an F.B.I. agent who said that the Nigerian vice president, Atiku Abubakar, now a candidate for president of that oil-rich West African nation, asked for at least half of the profits of a technology company controlled by Mr. Jefferson that was seeking to do business in Nigeria. About the same time last year, the documents said, Mr. Jefferson told colleagues of his plans to bribe Nigerian officials, including Mr. Abubakar, in exchange for their help in winning business in Nigeria, and that Mr. Abubakar would be paid as much as $500,000 in cash. According to the FBI, cell phone records and conversations between Jefferson and a confidential informant confirmed the scheme. The FBI did not provide conclusive evidence that any money was paid to Abubakar. But the FBI says the $90,000 in cash found in Jefferson's freezer was intended for Abubakar. Abubakar spoke openly about his inability to obtain a U.S. visa. "It is the sole prerogative of America to determine who they want in their country or not. I’m not running away from America. I applied, but wasn’t issued a visa," Abubakar said in an interview in December 2017. In 2004, President George W. Bush signed Presidential Proclamation 7750 which ban entry into the United States for current and former corrupt foreign officials -- especially those whose corruption has a nexus in the United States. The U.S. government does not publicly disclose why individuals are denied visas. But a former government official who has seen the documentation confirmed to Popular Information that Abubakar, until very recently, was banned from obtaining a U.S. visa under Proclamation 7750. So Abubakar had a problem. His inability to enter the United States was becoming a drag on his campaign to be the next president of Nigeria. So he hired Brian Ballard. Ballard is a lobbyist with deep connections to the Trump administration. Ballard, a prolific fundraiser, "chaired the Trump Victory organization" in Florida and "lobbied on behalf of the Trump Organization in the state for more than a decade." After Trump was elected, Ballard expanded his practice in DC and signed up a slew of A-list clients eager to tap into his connections. Ballard "also represents governments of Qatar, Turkey, Maldives, the Dominican Republic and Mali and lists US corporate giants Amazon, Sprint and Uber as clients." Raj Shah, Trump's former Principal Deputy Press Secretary left the White House last week to join Ballard's firm. On September 21, 2018, Abubakar, through his political party, The People’s Democratic Party, inked a contract with Ballard Partners for $1.1 million per year. Among other things, Ballard was to help Abubakar advance "democratic values and the rule of law in Nigeria." The contract required an immediate payment of $270,000 with another $270,000 due in late December. In January, Abubakar was able to travel to the United States. 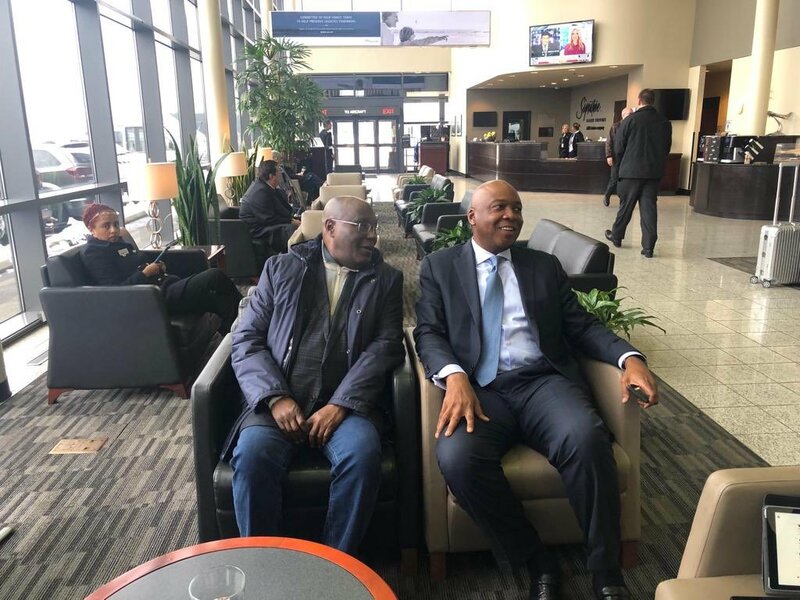 Just arrived at Washington Dulles International Airport, U.S.A with Alhaji @Atiku Abubakar. 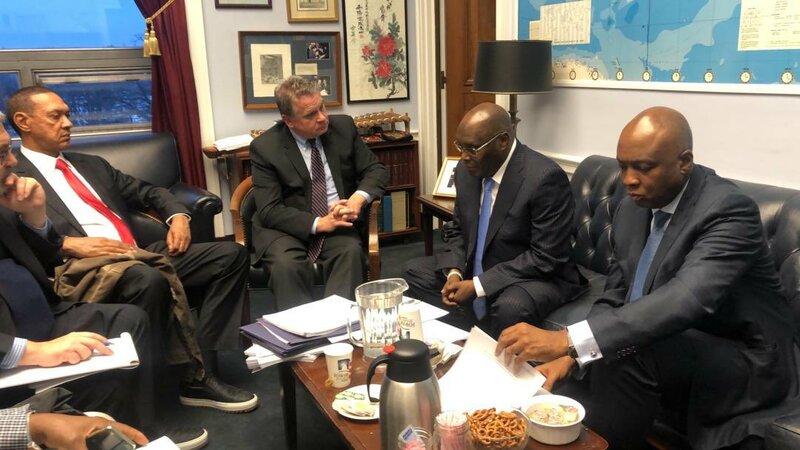 Despite his connections to the William Jefferson bribery scandal, he was even able to score a meeting with Congressman Chris Smith (R-NJ) and spoke at the U.S. Chamber of Commerce. Abubakar also claimed in an interview that he was scheduled to meet with officials at the State Department. Now Abubakar is back in Nigeria, buoyed by his trip to the United States as his campaign enters its final days. His campaign slogan is Trumpian: "Let's get Nigeria working again." He is running on a pledge "to double the size of Nigeria's economy to $900 billion by 2025" by privatizing the economy. I spoke with Hamish McKenzie, the author of Insane Mode -- an authoritative account of how Tesla upended the auto industry. McKenzie, who cut his teeth as a tech journalist, worked briefly at Tesla and is the co-founder of Substack, the company that powers the technology behind Popular Information. We talked about Elon Musk's "personality quirks," the demise of the internal combustion engine, and whether American automakers are prepared for what's coming. Q. If you read about Tesla in the newspaper, there is a lot of focus on Musk. The star of your book, however, is the company. Why did you take that approach? I think what happens with coverage of Tesla is that it gets all tangled up in the personality quirks of Elon Musk, which are very distracting and make for entertaining reading. And he is a completely unusual and wild figure, the likes of which history only sees every so often. So it's understandable that the coverage would be almost obsessed with him. But what that misses is the incredible impact that this company, which started off as a tiny startup with no hope and that everyone wrote off, has had on the automotive industry and starting to have on the energy industries as well. Q. Do you think the transition to electric cars is inevitable or does the government need to play a role? I do think that the transition is now inevitable. Electric cars are getting so much better and are getting so much cheaper, and those trends will accelerate so that it will soon become just obvious that you're going to buy an electric car instead of a gasoline car. However, this is going to take some time to play out and time is of the essence as the negative effects of climate change are accelerating as well. What governments can do is either accelerate the transition or slow it down through policy actions and regulations. And in the US, they've done some really good things like offer federal rebates for buying electric cars. But under Trump, those efforts are starting to be reversed. If you look to China, the country is doing a lot more than us to be an accelerator for the transition to zero emissions vehicles. By 2020 the government is going to require all major automakers to have an average fuel economy across their fleet of 42 miles per gallon, which is unachievable unless you have zero-emissions vehicles in your fleet. In China, you can get about $10,000 off the purchase of a zero-emissions vehicle through a combination of federal and state subsidies. Q. Do you see the day coming in the United States where there are no more gasoline powered vehicles sold? Yeah, I do. I think we have to go in that direction like we have to get off fossil fuels in order to meet our climate targets and stop the world being inundated by sea level rises. But also it will become clearer over time that electric cars are better and cheaper and we're just at the start of this improvement curve for electric cars. Q. The United States spent a lot of money bailing out domestic automakers a few years ago. Do you think they are adequately preparing for the transition to electric? At the minimum, we can credit them with having made some acknowledgement that a change has to happen, and all of them have announced that they are going to have many more electric vehicle models and they're going to bring them to market over the next several years -- 2025 seems to be a big marker year. But the moves are not as aggressive as they need to be. They are still in this position where they're trying to have their cake and eat it by being car companies that base the majority of their business on the internal combustion engine while having a side business in electric. I don't think that's going to work out well for them. You can support independent journalism that holds the powerful accountable -- and get Popular Information four times per week -- with a paid subscription.